While many of us are unfamiliar with the purple carrot, its roots date back thousands of years to the early beginnings of the vegetable we now know and love. While the purple carrot may be the forerunner in the carrot world, it is still widely undervalued. This is a shame because this darker shade of carrot is highly nutritious and promotes many healthy benefits to consumers. Carrots are marketed for a variety of health reasons such as the beta-carotenes that naturally occur in them. 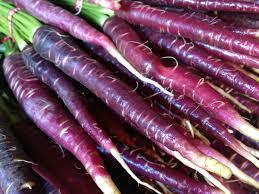 Purple carrots display all of the health benefits of the orange carrots we are familiar with including better vision, brighter skin, and are a great source of Vitamin A. The beta-carotenes in purple carrots are actually double as compared to what you will find with other carrot varieties.